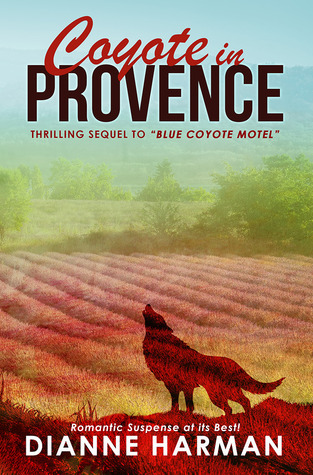 I was lucky enough to get an advance copy of “Coyote in Provence” by Dianne Harman, the long awaited sequel to her excellent novel “Blue Coyote Motel” and I am pleased to have found it just as remarkable and enjoyable as the first one. Maria, the ageing Mexican beauty and widow of an American scientist, is hiding in France under a new identity. Harman did a splendid job at tying everything up at the end of the last book but manages to unravel the story again easily. Maria is still ambitious and somewhat of a loose agent who won’t be satisfied with a boring and secluded life and therefore attracts people and problems. Of all people she falls for a detective from Southern California on a field trip to locate stolen art. A separate narrative introduces a filthily rich Afghan business woman with a big heart. I don’t want to give away much more of the plot to avoid spoilers. All I will say is that said woman is an amazing character and a great and intriguing addition to the already well composed and wonderful cast. Harman really knows how to write entertaining and thoughtful stories with characters caught in the grey areas of morality and legality. With clever juxtaposition and sharp dialogue Harman makes several important points about those (too often contradictory) concepts. I was impressed how the narratives then come together and how the themes from book one returned so naturally and organically into this story. As far as sequels go this is masterfully crafted and particularly pleasing as the plot is not predictable and the book contains a lot of new elements, yet retains the original character of the series / trilogy (Maybe we can persuade Harman to go beyond the third book?). I found this a gripping and compulsive read and – although I really hate to use this worn out phrase in reviews – I cannot wait for the next book to find out more about how the remaining issues will be resolved. A great equal to book one and a real treat.